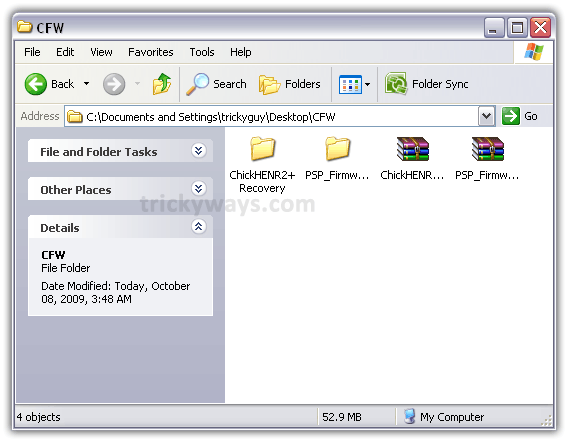 In this PSP tutorial, you will learn how to install custom firmware of your PSP 100x (Phat) and PSP 200x(Slim) using TIFF exploit – ChickHEN. Create a folder on your desktop and name it CFW. Download the files linked below and extract them into CFW folder. Skip this step if your PSP is already on Firmware 5.03. 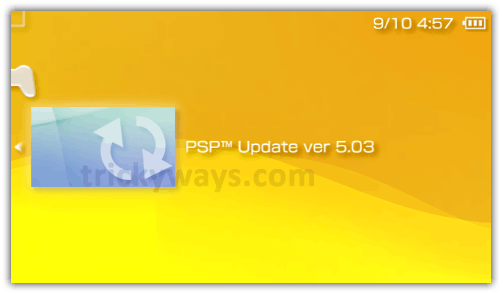 If your PSP firmware version is below 5.03 you need to update it to firmware 5.03 first. Connect your PSP to computer via USB. Your PSP memory stick will appear in your computer. Now Press the O button of your PSP to disconnect it from USB. Now go to Game > Memory Stick on your PSP. There you will find the PSP firmware version 5.03. Press the X on PSP button to execute it. It will install firmware 5.03 on your PSP. 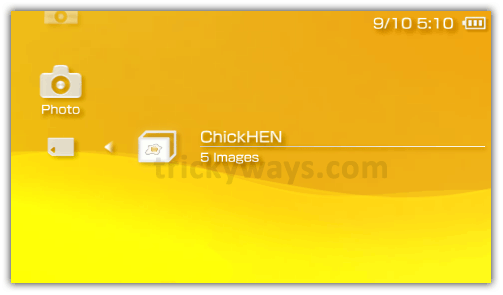 Assuming that your PSP is on Firmware 5.03, now is the time to load chickHEN R2. Reconnect your PSP to your computer via USB. Now it’s time to unplug your PSP from the computer and load ChickHEN R2. 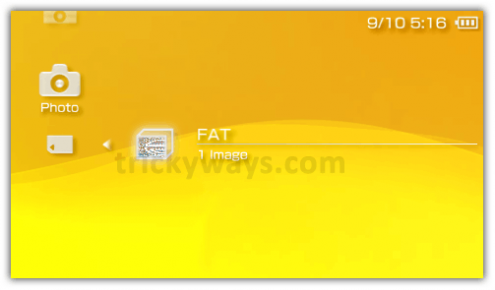 From your PSP, Go over to Photo > Memory Stick and click on the FAT folder (if you have a Phat) or ChickHEN folder (if you have a Slim). The screen should blank out then flash green, showing that ChickHEN has loaded. The PSP will then reboot automatically. Assuming that ChickHEN has successfully loaded. 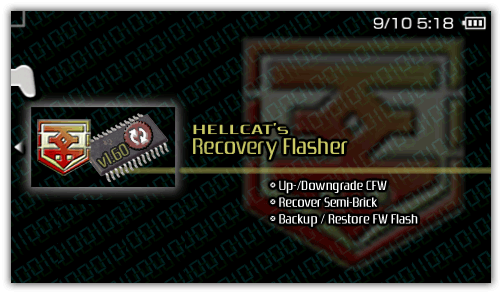 Now on your PSP scroll over to Game > Memory Stick and load Hellcat’s Recovery Flasher. When it loads, choose I agree to the notice informing you that the program touches internal flash. A brown screen menu will appear. Scroll down to Install M33 CFW and press X button. Then you will be asked if you want to reset your settings. Choose the first option (reset). Then it will start install Custom Firmware on your PSP. When all done, press the X button and turn ON your PSP manually. Congratz! You have successfully installed Custom Firmware (CFW) on your PSP. Input your desired settings again and enjoy 5.00 M33 on your PSP. Really good guide for PSP custom firmware, Thanks. Is there any other way to hack psp? yeah you updates ur firmware to 5.03..
but the one living inside Recover flasher is 5.00 M33-6 which is CFW. and is installed in the end..
Hello i’ve got chickhen installed and then the cfw 5.00 M33-6, everything worked !!! But when i tried to play homebrew games (iso) my psp says (this game can not be started these data are damaged) what can i do about it? I can’t find a sollution. hey you can use the “m33 vsh menu” or push the “SELECT button” then you can see the “UMD ISO MODE”‘S deafault VALUE is “NORMAL” change it in “M33 DRIVER” by pushing the (>) button,.,. i hope it will help you a lot.,,. THANKS,.,. I was using firmware 5.00 M33. Recently i upgraded it to 6.00. Now the problem is, I cannot play ISO file from M:ISO. Whether i can degrade it back to 5.00 M33 or any other software has to be installed to play ISO files in version 6.00 itself? Please someone help me to solve it out. You guys are a great inspiration! Keep up the great work. Thanks for the fast reply. Its all working fine now also I didn’t have a UMD inside before but when its inside it works too^^ and I have notice that some games don’t work because it’s a bad file lucky I got afew different versions of the same game haha. I still haven’t deleted any of the h.bin, egghunt.bin files just incase something goes wrong hope this doesn’t affect the firmware?? great tutorial. confirmed working on psp phat (1000 series). can now play homebrew and iso games 🙂 thanks! I have ISOs and CSOs on my comp. if some of the isos n csos r not working in ur custom firmware it is because the game requires greater firmware…but i hav a software which decrypts the iso/cso file n rebuild it according to ur firmware..i wanted to play fifa 2010 but it wasnt working on my 3.90 m33-3…but i decrypted the iso file n rebuilded it…n yipee its working…if anyone need this software let me kno..i will be glad to help!! How do i know if my PSP2k is [TA-088v3] , And If it it, and i did this process will it damage my PSP? Follow this guide to the installation of ChickHen but do NOT perform the custom restore via hellcat.. Install PSPIdent on PSP.. it will tell you the motherboard model..
maybe i’m not lucky to have PSP-2000s [TA-088v3], the flasher won’t work. any suggestions to make this model play ISO games? i have a psp2000 slim i did all step to lunch hellcat. but when i run hellcat it prompt me “Recovery flasher detected a not cfw capable psp model. Unfortunately, due to added/fixed security measures by sony this ,pdel of PSP is NOT capable of having a CFW flashed toit. …. now wht can i do ? then in the end you’ll be directed to different guides for different PSPs. Hey. I downloaded the PSPtm Update Ver 5.03 but when i press o it says The game could not be started (DADADADA). Did you install custom firmware after installing official firmware ver. 5.03? Actually I dunno if i installed the official one. ._. i can’t run chickhenr2 on my psp phat what seems to be the problem? i have done all the steps… but when i am in the hellcat’s and i choose install m33 and choose reset there is an error. everything seems to work great up to the Reboot to Accept Terms screen..
i run the Eggsploit image a million times till it works. then i go to the games folder and run the Hellcats recovery flaser, The PSP reboots to the accept terms screen, but is frozen there. i cant move the “X” to accept, or do anything else. i restart and the screen comes right back. I have to remove the battery and start the whole process over again, only to get the same resulsts. its a fully compatable PSP PHATy. and i checked the motherboard model info with the supplied tools from this site. Will the ChickHENR2 + Recovery work on any filmware (My psp is a 1002 with 4.05 filmware) Will it work?, This is because i have not got a battery for the install of the 5.03 filmware. Thanks. Had difficulty also running hellcat recovery. But i figured it out that it requires OFW 5.0.
if you fail to load hellcat properly. Thanks trickYguY for the instructions. Now, there are too many files in my ms.
or can i just format my ms? when i tried to open Hellcat’s Recovery Flasher it says This game cannot be started.The data is corrupted. The “data is corrupted” error message appears when the chickHEN R2 is not yet properly loaded. If it just hangup and shutdown PSP, then you got to retry until it automatically reboot your PSP. how to downgrade psp 6.0 to 5.03? Hey.. I have Psp 2000 4.01 Firmware.. is it possible to hack this?! and i dont even know what model my motherboard is? so i cant put games yet. i dont want to brick my PSP.. whahh.. Hoping for your REPLY.. thnks..
“Install CFW (of version selected)” Instead of “Install M33 CFW (of version selected)” if i choose that i click reset on the next part and it comes up with this. Need help! There have been critical errors! ABORTING!!! No harm has been done! Press any button…. i also have the same exact problem….. what do i do? yea can anyone plzzzzz tell us what to do with this problem? it was not downlaod from giver URL so plz tell me as soon as possible. Firmware file is uploaded again. 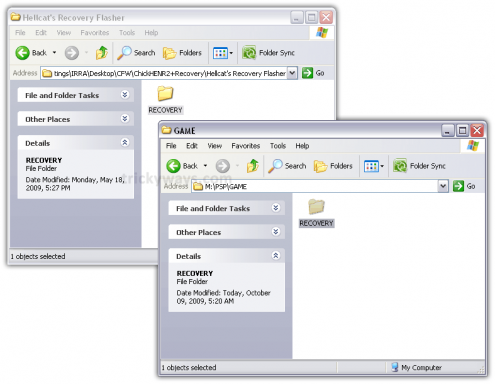 We need to create ChicHenR2+recovery file again and will upload soon. hey it gonna be bricked..
dear i m stil confused in Step 3 – Hellcat’s Recovery Flasher how to get there ? …i have the same problem, is any solution found out? okay, I think I know what the response to this will be but, I’ve got a fat PSP which since I’ve never really used the CFW on and needed to update to play one of the games I got recently, I decided to update it to 6.00, is there any CFW out there that work with 6.00 or am I going to have to go pandora to play ISO’s? Thank you for this! It took me a while but I got it and it works perfectly! Can you delete the Hellcat program after you updated to CFW? Is it possible to mod a psp 1000 phat with firmware 6.30? Hay, what do you do if your psp software is at 6.20? Hey Guys, Im new to CFW and need some help. Anyways, I just installed 5.0 33 CFW or whatever on my FAT PSP. It says that it worked, and when im at Home on the PSP menu if i hold select it comes up with a new menu. When I load my game (MH2 Freedom…), I don’t understand how to get to the CFW code. I heard you hold like select or D-Pad up, but thats not working. Do i need to change a setting or something to allow me to view the CFW menu while playing a game? i encountered critical errors, it says error opening 500.PBP and errors ong loading updater modules. please help. error opening 500.PBP what will i do? Hay When i go to install it said error unpacking files and dosent do it i dont know why can you help? the functions are reverse i mean the accept button is O and the cancel button is X..will this work? Hey I have a psp 2004 with TA-088 v2. I successfully installed the official 5.03 firmware provided and also the chickHenR2. But when I run the hellcat recovery flasher and click ‘Install CFW(of version selected above)’ it fails. It says there have been fatal errors. * Disabling settings formal, clearing registry! I’ve got a psp 1K with OFW 6.35. I’m having difficulties downgrading (it keeps telling me there is no need to update), is this possibly due to the fact that I have the latest OFW or am I doing the guide wrong? Keeping in mind that I’m completely new to this stuff. downlaod URL is not working so plz tell me ? I get to the part were i press the eggsploit pic, it reboots my psp, all fine an dandy. but when i use hellcat’s recovery flash, and get to the “reset(format) settings as well” it gives me an ERROR, what shall i do? im having the same errors about 500.PBP, please help us tricky guy. Hi. i have a psp 2000 (6.35) and i want to install farmware but i dont know which frmware i should install because there are many framware. I would like to know also haw many fail are inside in the right winrar. ok so my psp is 3.71 M33-2 and when i try to update it ..it shows a folder on my game thing on my psp and when i press x on it ..it works ..and when i agree all the conditions it says ”no memory card inserted” i have a 4gb memory card with 2000 mb space ..what do i do? I get “error opening 500.pbp” (0x80010002) when i try to install the firmware :(. ANy ideas? How do you install these games on psp 1000 if you have v6.60 software? one question. Can u still instal custom firmware if your psp 2000 is already hacked by using pandora battery? When i try to install the update; i make a new folder in game (update, all CAPS) place that file in folder, and when i go under Games on my PSP it says (corrupted file) and when i open back up the folder on my pc theres no file in UPDATE anymore but when i go check on my psp there is still “Corrupted Data” PLEASE HELP!!! hey trickyguy i have a psp slim 2000 and i can’t open the chikhen image, my psp just shuts down and i’ve tried this a lot of times and everytime its the same what can i do??? mhm i have 6.60 PRO-B10 if i install the chicken does games will work or i have to downgrade fw and then install CFW? 1) This is not the page to look at if you have a newer 2000 or if you have a 3000. Go to the other page. 2) Yep, the Recovery link here is dead. That’s OK. Google “hellcat’s recovery flasher” to find the link for download. I got it in less than a minute. I’m still on my way to “freeing” my PSP I just bought. So far so good, it’s a used PSP-1000. Dude at the store was like “Uh, you don’t want the new one?” Nope! Can i delete everythink after i’m done? does anyone has ChichHEN R2 and Hellcat’s Recovery Flasher here?the one in this site is broke and not available already. Please give me please please! Ok after a full weekend trying to get chickHEN R2 to load on to my PSP and Hellcat recovery 1.65 (which also didn’t work) nor the other vesions of HELLCAT, I might add, I have finally sussed out what to do. I have read so many posts and done this from scratch but each time I get to the Hellcat recovery screen it ‘errors’ on me or the program couldn’t find the correct 5.00 version and there were some other reasons it wouldn’t load but I can remember them all. First up, chickHEN is a b*tch to load, end of!!! It will work eventually but you have to have lots of patience and realise that there is a set procedure of a sort to get this to work. It is very much a trial an error but it is worth it in the end, I assure you. Anyway I have a white psp TA-082 motherboard with OFW 3.11 running on it. The only way to get 3.11 upgraded to a CFW (preferably 5.00 M33 6) was to buy a pandora battery right? Wrong, the battery was rubbish, didn’t fit in my machine to even charge up let alone get it to run. I had to sit there holding this thing in but after a few flashes of the battery light it stopped and did nothing. The instructions said hold L shoulder button whilst turning on the unit da da da but nothing happened. Probably defentive or incorrect software on MS or both. I dunno, but it was certainly a waste of time and money. Now chickHEN R2 is what I did to get this working but boy was it difficult at first. I am no way a noob but come on, if you havent had to go down this route before then aren’t we all? People who think they are the dogs and knock people who don’t know make me sick and are no credit to the gaming world. I hope to put together a comprehensive guide so people don’t have to go through what I had to to get this to work. Anyway, I digress. here goes with what I had to endure. I will guarantee that if you follow this guide to the letter then it will work but you have to pay attention!!!!! If you haven’t already got the official Sony 5.03 firmware (fw) then download it and install it. Put the eboot in a folder and rename the folder (not the eboot) to ‘UPDATE’ (in capitals) then drop the eboot inside the folder. 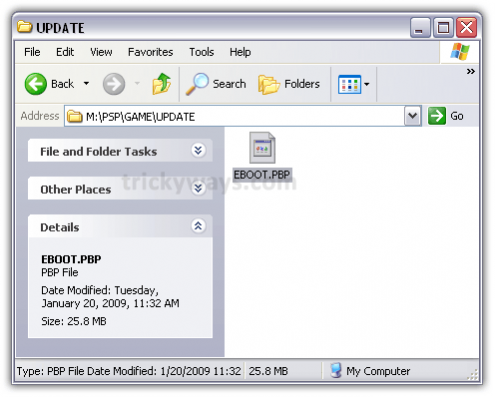 link your PSP to your computer and put this folder called ‘UPDATE’ in the PSP/GAME folder and leave it there. Now, unlink you USB from the computer and turn on your PSP. Navigate to the memory stick and you should see the update. Make sure your battery is fully charged or better still plug in your mains adapter and click on the update. The psp should start updating. DONT turn off the psp or turn it off at the mains whilst you are doing this. Be careful and basically just pay attention. Ok after a short while the unit should have updated. Scroll to you system settings on your PSP and it should read 5.03. To run chickHEN R2 the PSP ‘NEEDS’ to be on 5.03 official firmware, not 5.00 or anything else just 5.03. So if you haven’t already got 5.03 then go and get it and install it now. Once the PSP states that it is 5.03 then you are doing great. Next go to your computer, format your memory stick from the system settings. It is important that you do this. Next download chickHEN R2 (R2 stands for ‘revision 2’). Now when you download this it will give you a RAR file. Make sure chickHEN R2 is for the PSP PHAT and not the slim version. I think it should work anyway but just make sure that it is for the PHAT PSP. The difference being is that the one I downloaded had five GIFF files which looked likes egg yolks yet the other download only had one picture of a coin or something of that nature. Anyway unpack your download with WINRAR or whatever. You will see an exploit file which is a TIFF file and a H.bin file. Take the TIFF file (it has to be a TIFF file and not a GIFF, I say this because my download was a GIFF file that was never going to work) and put it in your PHOTO folder, If you don’t have a PHOTO folder put the tiff file in PICTURE instead. Next put the other white file H.BIN in the root directory (the first screen that you come to when you connect your psp to the computer) don’t put it anywhere else. Download HELLCAT 1.65 or 1.50 recovery program. Any is fine but the later versions do not specify the ‘install M33 on the options. Its only the old version 1.50 that says that but don’t worry as they all do the same thing. You will see what I mean later on. 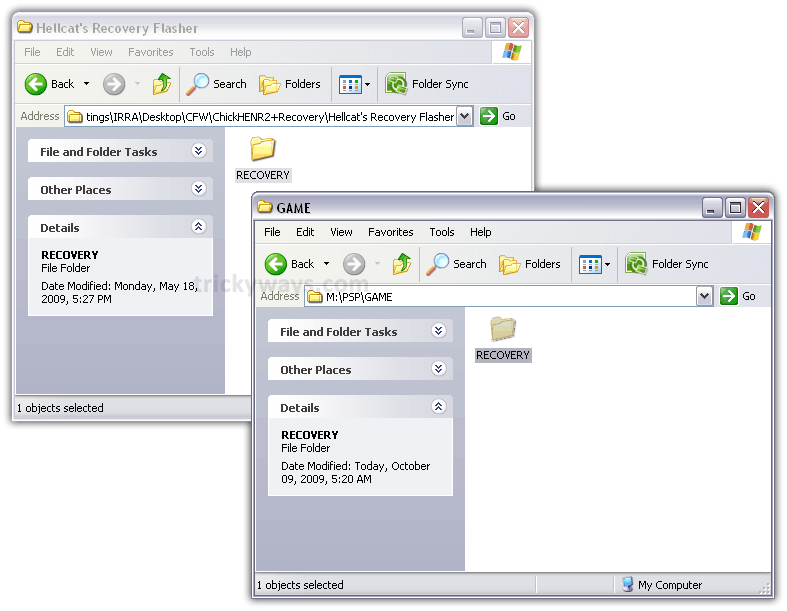 Put the HELLCAT RECOVERY folder in to your PSP/GAME directory. Next download the official 5.00 eboot for official firmware. Don’t download 5.03 or any other version just the 5.00 and make sure that it is the official version. When you have done this rename the eboot to 500 (not 500.PBP) as it is already a PBP extension and that would just make it 500.PBP.PBP which is wrong). This is where I was going wrong I think.I just made sure that I had this file everywhere so the PSP could not give me any excuses that it couldn’t find it, like it had been doing.So copy this 500 file and place it into the PSP/GAME/RECOVERY folder and then copy the file on it’s own just below the RECOVERY folder..Then make a folder named ‘UPDATE’ and drop the 500 file into that as well and put that folder into the RECOVERY folder and underneath the RECOVERY folder. Then put the ‘UPDATE’ folder on your root directory (just to make sure) and a loose 500 file below that also on you root directory. Remember the more places you can put it the more chance you have of it working. It may seem over the top and it is for sure, to put this 500 file in so many different places but I am not actually sure other than the root directory where this file is supposed to go. It should actually just go into the root directory (as all the threads suggest but so what if you have more than you need. OK now, go to retore default settings on your PSP and go through the instructions. The PSP will then reboot. Change your character set in your system settings to U.S and turn off UMD auto start to off. This is very important as this seems to improve the chances of ChickHEN acually loading. Now scoll up and down on the menu screen of the PSP. I don’t think this actually does anything but the more you try the better chance of it working. Click on the PHOTO/PICTURE on your PSP. Be very patient as this does not always work. In fact it works 3 out of 10 times but it WILL work eventually. As a tip I would just keep you battery lid off as taking this on and off will eventually drive you mad unless the PSP start up music gets there first. Work on clicking the X button immediately you see the TIFF file on the PSP. Eventually the screen will blink green (I think) and it will look corrupted, then the PSP will reset itself. You are now officially running chickHEN R2 and if you don’t believe me then check you system settings. Just remember to be patient and it can take ages to get this to eventually work. It is a major achievment just getting this far but you will not have to do all this again if you can get to the end and install the custom firmware, so persevere. OK, once chickHEN is running simply navigate to your memory stick and click on the HELLCAT installer, which ever version you have should be fine, just bear in mind that only the HELLCAT 1.50 version will show up the ‘install M33 cfw’ option. I was looking everywhere for this and couldn’t understand why the screenshots on the threads I was viewing on the net showed this option but my version didn’t. It’s only because the version on the net is the older 1.50 version. Once you in HELLCAT simply follow the instructions and enter the program. Click on install M33 custom firmware or whatever it says (it is just the top line option anyway) and make sure it directed to install 5.00 as you can pick which version you wish to install. Click on reset settings, which is the next option underneath and the PSP ‘should’ install the custom firmware 5.00 M33 4 on to your PSP. Should you decide that you want 5.00 M33 6 then just download the cfw 5.00 m33 6 off the net, place the eboot in an update folder and put this in PSP/GAME and run the update from your memory stick just like you did when you originally updated your PSP with 5.03 at the beginning of the tutorial. I think that’s what saved me, I assumed the 5.3 Eboot I used to update my PSP would be the same file I needed to change to 500 – completly wrong. Mega big thanks for thanks! Hello I would really like to try this, but the “ChickHENR2 and Hellcat’s Recovery Flasher” link is no more 🙁 ; could you please upload it again, please? thanks! P.S i did not use the hellcats thing you uploaded because the link is broken, could this be the problem? right, I’m on 6.6 software and it wont let me degrade it…. any help? Mine just says Install CFW. When I click on that I get a bunch of error notifications. Is there a step somewhere I missed? I’m confused at this point. I have a Mac, can anyone help, how I can do this whole process on Mac and my PSP slim? Everywhere I can find only how it is done on PC, but can any of you help, how I can do the same on Mac? I try to install ChickHEN R2 I do all you say ..but when I go to photo Fat .. the device just hangon and shutdown..I try more then 10 times..and no succes… Can you help me? WHY DOES MY PSP IS SHUT DOWN WHEN I UPDATE THE FIMWARE? my psp model is n1004 which frimware i should download..??? I have custom firmware 3.40 oe-a, will this guide work for me? I’ve already placed the OFW in the root of the device/GAME folder and renamed both 500.PBP. Hellcat’s Recovery still fails. This is with a PSP 1000. My PSP is on version 6.60 so I followed the steps, and loaded update 5.03 onto my PSP. It won’t let me down-grade it, it just says, “The system software of your PSP system is version 6.60. There is no need to update.” What do I do now? The chickenhenr2+recovery.zip is “error file not found” on the rapidshare..
Hi guys, I have a problem. I failed at 1st step (facepalm). So when i paste firmware to that folder everything is fine and then i try to play file through PSP and it pops out everytime i press it “The system software of your PSP system is version 9.90. There is no need to update” so wtf??? Someone please help me cause it have no idea what to do. Thank you! My is got crashed.. Unkowningly I formatted the internal os drive of 30mb using PC..
Hi, nice tutorial but the downloads are not working anymore! I got the psp1004 with the 6.60 firmware. Would this work on my psp? Its original so i only got 32mb memory stick. The most firmware versions got 44mb or somthing so its not fitting. Does the install downgrade my psp version since is on 6.39? What if mine is 5.50? Is that ok? When I am clicking on PSP_Firmware_5.03. A new windows opens and say that the “THIS PAGE CANNOT BE OPPENED” what can I do now???? ?